October always seems to begin a fairly intensive planning period for me that lasts through the holidays. As you enter the last quarter of the year, you generally have a pretty good idea of how close you will come to hitting your goals, and begin to think about where you’d like to be over the course of the next year. Perhaps it is because of this that I enter into this planning period, constantly running numbers and projecting out into the future. After getting married earlier this year, things are without a doubt different, but in an immensely positive way. Planning for two is fun, as we each weigh in with our own respective wants and desires, but share a common objective. But enough about that, you folks are here to count some cash and see how things are going. So without further ado, let’s dive into October’s passive income and blog update! Blog Pageviews: After experiencing the highs of a strong bounce-back month in September, October upped the ante even further and became a record setter. Flying by my previous high from back in March of this year, October checked in at a sweet 7,716, an average of roughly 249 per day. Needless to say, the credit goes to you the readers, so thank you for your support. My secondary goal for the year is to hit 20,000 unique visitors, or users, as Google now calls them. I continue to track along well with this goal, hitting a total of 15,362 for the year to date. While I’m behind the annualized pace for this goal, I’m hopeful and confident that the increase in readership each month will translate into a late year push toward obtaining this goal. During the month I was able to post five times, and those posts are listed below in reverse order of posting. Feel free to check them out! Lending Club/Prosper: October turned in my third strongest net interest total since I began investing in peer to peer lending. With a combined $183.03 across both all three accounts, I was able to generate a strong level of passive income with very little effort. So like clockwork, I continue to experience returns in excess of 10%. As I said last month, I will likely come nowhere close to my intended income goals from my peer to peer lending accounts. Looking forward, I will likely begin to add some capital to my accounts, how much and to which account has yet to be determined, but this should have a positive impact on my net interest moving forward. Of course, reinvesting triple digits of net interest each month will also continue to compound and grow my income stream. Dividends: Unlike September’s record setting numbers, October returns back to earth as the first month of each quarter has the lowest payouts. However, as I invest additional capital into my portfolio, this first month will continue to build into a respectable number all by itself. During the month of October, I received $91.30 of dividends from six different companies, an increase of 43.3% over last year’s $63.71. Be sure to check out my 2014 Dividend Calendar which shows each dividend received by portfolio, and projects my future dividends for the year! While not quite triple digits, I’m getting pretty close, which is awesome considering it is a “down” month. Below is a list of all my dividends received by company and whether those dividends were reinvested directly. In addition to the dividends being reinvested above, I also made $1,010 worth of purchases in my Loyal3 account. The details of those purchases can be found here: Trades – October No-Cost Dividend Growth Portfolio Purchases. In addition to my Loyal3 transactions, I purchased an additional 85 shares of General Electric during October. When factoring in my dividend reinvestments, dividend increases, and the stock purchases during the past month, my forward 12-month dividends increased to $1,756.51. This represents an increase of $127.75 from September’s mark, and an increase of $498.44 from a year ago. 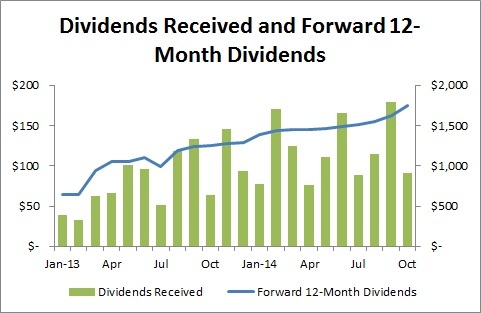 The below chart reflects my dividends received, as well as my forward 12-month dividends since the beginning of 2013, when I started tracking things on the blog. I’ve switched this chart to a bar graph, as it more clearly shows the quarterly cycling of dividend income. During October, I received a total of $274.33 of passive income, well diversified across my two investment types, dividends and peer to peer lending. Overall, my year-to-date passive income earned is $2,686.22, which means I’ve now surpassed 2013’s passive income total. For 2014, I am averaging $268.62 per month of passive income. You can find below my updated passive income chart showing my overall passive income for the last 22 months, since January 2013. October was another rock solid month for passive income and an even better month for blogging. As of right now, things are shaping up to be pretty exciting throughout the rest of the year! Hope you all rocked October! 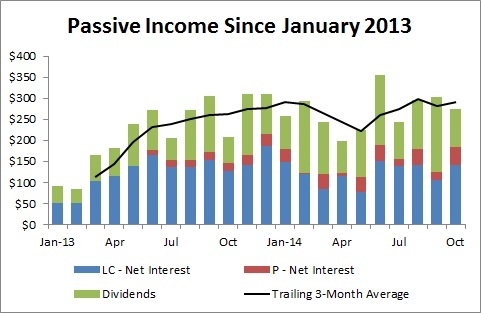 Don’t hesitate to look around; you can find details on the various aspects of my passive income pieces under their respective pages, Lending Club, Prosper, and the completely revamped Dividend Growth Portfolio. Additionally, you can find all of my monthly updates under the Passive Income Updates page, and all my monthly updates and incremental progress towards my 2014 goals on the Goals page. Thats a neat sum of passive income, W2R. Love the fact that its diversified and coming from different sources. Best wishes in your continued success. Also with your plan on growing your network and growing those pageviews as well. Thank you R2R! I strongly believe in diversification, not just from different holdings within a portfolio, but across the income streams. You’ve been killing it in the same way, so it’s good to have someone else who shares the same mentality. Truly awesome month! You shattered your year over year dividend income in October and really had a busy month with purchases. I like the GE purchase and wished I would have jumped on board when it was a bit lower. Oh well, I’m sure another opportunity will present itself soon. I have BP on my radar for the next purchase. October was indeed a great month, and I should be in a position to accelerate my growth given recent investments and some future planned investments. I certainly lucked out by having some capital available to pounce with the GE purchase. I’d be happy to double or triple that position overnight if prices were still the same. Good luck with BP if you make a move, and thanks for stopping by! first of all, congratulations on your marriage. All the best to both of you! Your passive income continues to be nicely diversified. I also like your overall set of goals. You are covering a lot of important aspects. The only thing I would wish to see, are initiatives to get back in track in certain areas, take page views for example. I feel like the real benefit of having goals in place comes from the adjustments you make based on the insights they might offer. Thank you GI! I am happy to have the diversification, and would love to expand on that further. What that looks like, I’m not sure, but I’m game to find out. The initiatives for increasing pageviews are fairly simple, and something I tend not to focus on. Post consistently, post great content, and network with others in your niche. Since I’ve had a couple of lapses in blogging over the last couple of years, my momentum gets stalled and reverses course during those points in time, so avoiding another lapse is pretty much all it takes at this point. Hope that covers your wish! Yes, thanks for explaining and good luck avoiding lapses. Not a problem! Life has a way of interfering at times, but hopefully I can avoid the lapses going forward. Great month once again Adam! Keep driving this forward as you are and reap the rewards! Happy Holidays to you and your new bride! Congratulations on your continued success with P2P lending. I know I am continuing to enjoy the ride, even as returns begin to regress towards the mean. As for Loyal3, I absolutely understand why they stopped the credit cards, and respect their decision to do so. I won’t stop investing with them, but realistically probably won’t put as much cash to work through them. Happy Holidays to you as well, and thanks for your comments! Thank you Bryan! The income diversification is important to me, and something I will continue to work on going forward. Always fun to read about blog stats besides income. Nice to see your dividend income keep growing the way it is and your page views and blog traffic increasing as well. Nice to know when you write something it actually is getting seen by others. Thanks for sharing your update with us and look forward to the next. DivHut, I’m glad you enjoy these updates and the added information outside of the passive income numbers. The analytical person inside loves the added number crunching and seeing the growth continue. Thanks for stopping by and best of luck as you finish 2014. Congrats on the marriage earlier this year; sorry I’m a little late to the punch. I got married in Sep-2013 and I fully understand how hard it is balance the needs & wants of two people. Thanks for the update on the portfolio. It’s great to see things trucking along for you. I look forward to future articles & updates. Happy Investing! Congratulations yourself on getting married. Thanks for stopping by and best of luck with the new blog. 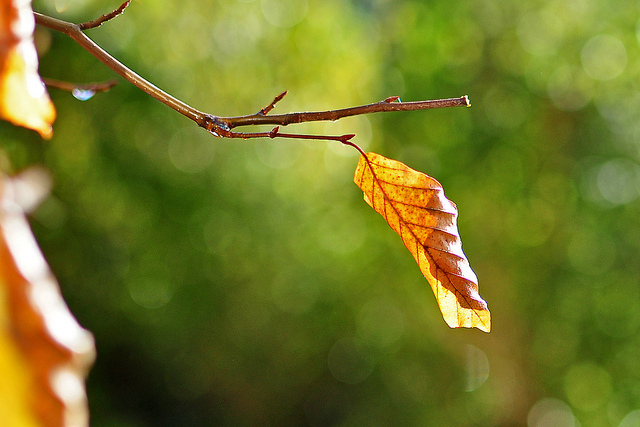 Thanks for sharing your October update…its always nice to see fellow bloggers’ progress. Like you, we also have passive income coming from Dividends, Prosper, and Lending Club. Having all three brings a whole new meaning to compound interest as you can almost guarantee that your money is constantly being reinvested into something productive. Keep up the great work! Absolutely agree that income diversification is important, and watching the corresponding cash get reinvested is even better. I’m looking forward to expanding my investments and continue building a larger and larger stream of passive income. Thank you for the comments and for stopping by AFFJ! Great month, my friend. Really solid passive income, and well spread out across a number of asset classes/accounts. Love the jump in YOY passive income. Looks like you’re putting away a lot of capital these days, which will surely drive those charts upward. I think you’ll have a strong finish to 2014, which will set you up nicely for next year. The jump is always good, as is the ability to expand my investments and build an ever growing stream of passive income. While previously capital wasn’t available for these portfolios, I now have the ability to start injecting some cash which should really accelerate my growth over the next couple of years. Thanks for the support and comments DM! Congratulations on your marriage. I hope all is well. I think we are on the same page with L3. I will continue to use it when an opportunity presents itself. I put 30 buy orders since Friday and I am still waiting for the orders to come through. I think Veterans day has stalled all my purchases but I cant wait to do a write up on it. Also I love all the income sources and wish my state offered lending club. I might get into real estate investing as another source of income. We will see how that goes. Thanks for the write up! Thanks DM! Wow, 30 buy orders? Heck of a lot of purchases! Looking forward to seeing what you’ve invested. I’ve jumped on a few purchases as well, but certainly not by that much. Best of luck in finding another source of income, hopefully something turns up! Great month! Even better YTD passive income! Thanks for sharing LOYAL3 with us, because of you I opened a L3 account. Keep it up and goodluck! FFF, thanks for the support, and glad to have you as a fellow user of Loyal3! Keep up the good work yourself. For me, things are fairly split between referrers and Google Search. I also have a good chunk from social media and direct visits. Hope that answers your question; I know I like reviewing the stats regularly as well.